CBI Joint Director Arun Kumar Sharma’s son and daughter are on the board of directors of at least four companies where their partners range from a person mentioned in the list of undesirable contact men to the relative of a caterer recently raided by the CBI. CBI Joint Director Arun Kumar Sharma’s son and daughter are on the board of directors of at least four companies where their partners range from a person mentioned in the list of undesirable contact men and the relative of a caterer recently raided by the CBI to the wife of a CBI officer who worked closely with Sharma. These are the findings of an investigation by The Indian Express of Registrar of Companies (RoC) records and visits to the registered addresses of these companies. Sharma’s son Kushagra Sharma is a director in four companies while his daughter is a director in one company. As many as four companies did not exist on their registered addresses while as many had not done any business since their incorporation. In the ongoing war between CBI Director Alok Verma and Special Director Rakesh Asthana, the latter wrote to the Cabinet Secretary on August 24 alleging that seven shell companies were associated with Sharma where his son, daughter or wife of personal staff Ashwani Gupta were directors. On Tuesday, both Verma and Asthana were divested of their powers by the government and on Wednesday Sharma was shunted out to the moribund Multi Disciplinary Monitoring Agency and Gupta repatriated to his parent cadre of the Intelligence Bureau. In his letter to the Cabinet Secretary, Asthana alleged that Niveshan Ventures has been floated by Kushagra and one Pradeep Kumar Rai in partnership. Asthana has alleged that Rai is in the list of Undesirable Contact Men. RoC records show that Niveshan was registered at Delhi Riding Club at No. 1 Safdarjung Road, New Delhi on November 16, 2017. On October 4, 2018, however, it changed its registered address to S 31, S 32 A, First Floor, Hargobind Enclave, Opposite DLF Gate, New Delhi. Niveshan Ventures is a Limited Liability Partnership firm incorporated with a contributory fund of Rs 10,000 from Kushagra and Rai, according to the filings. The incorporation certificate of the company says that the form has been approved by Rakesh Kumar Tiwari. Tiwari once ran the CBI canteen and was recently raided by CBI at the Palika Services Officers Institute (PSOI) in Chanakyapuri for allegedly moving money for bureaucrats. RoC filings show that the company has not filed any financials since its incorporation. Interestingly, the rent agreement for the properties shows it is signed between Niveshan Ventures and Rishi Pal Singh. Colony residents said there was no Rishi Pal Singh in the colony. RoC records show Brevity was incorporated on April 30, 2015 at A-4, Suryavansh Appt, Near Ishwarbhuvan, Opp. Jogger’s Park, Commerce Six Road, Navrangpura, Ahmedabad. The company has a paid up capital of Rs 1 lakh and mentions Kushagra Sharma and Pratik Kamal Kumar Ojha as the two directors. The company has not filed any financials with the RoC. Metaworld Ecotech Private Limited is an unlisted private company incorporated on February 20, 2017, according to RoC records. The registered office of the company is at shop No F 10, Manish Twin Plaza, Plot No. 2, Sector 11, Dwarka, New Delhi. The total paid-up capital of the company is Rs 1 lakh. The company mentions Arjita Sharma, Tamannaben Parwani and Anju Gupta as directors. Arjita is the daughter of Arun Kumar Sharma. They all joined the company on the day of incorporation. The company has not filed any financials with the RoC. Asthana in his complaint has said that Anju Gupta is the wife of Ashwani Gupta, the staff officer of Sharma before he was repatriated to IB. When The Indian Express visited the registered address of the company, it was shut. The Indian Express also examined the credentials of three other companies where Kushagra, Arjita or Anju Gupta were directors. 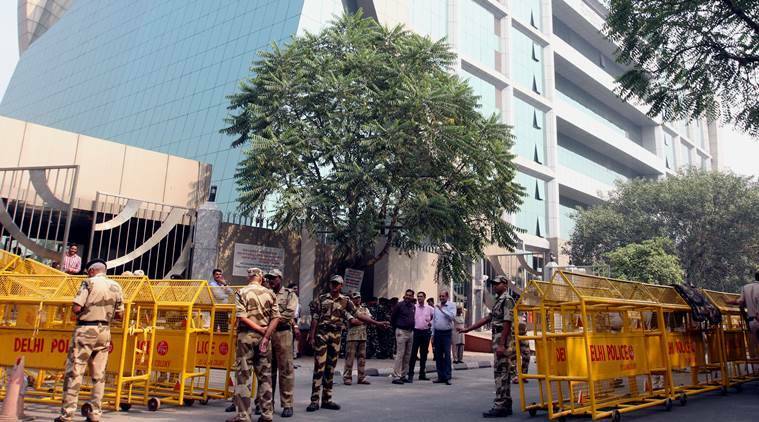 Of these, Whitecubes Brine Science Pvt Ltd, with Kushagra as director, was found to have a chartered accountant firm at its registered address in Ahmedabad. Evolve Projects and Management Consultancy, with Kushagra as director, did not exist at the registered address in Ahmedabad. Similarly, SD Continental Pvt Ltd, with Anju Gupta as director, had a family living at its registered address in Paharaganj, Delhi. None of the companies had done any business since incorporation. A detailed questionnaire listing the findings was emailed to Kushagra Sharma on October 23. On October 25, The Indian Express called him for a reply. In response, he said he would like to meet and provide his version. However, through Friday he was unavailable for comment. A K Sharma did not respond to calls or text messages. Arjita Sharma, too, did not respond to an email. Emails were sent to all companies but none responded.